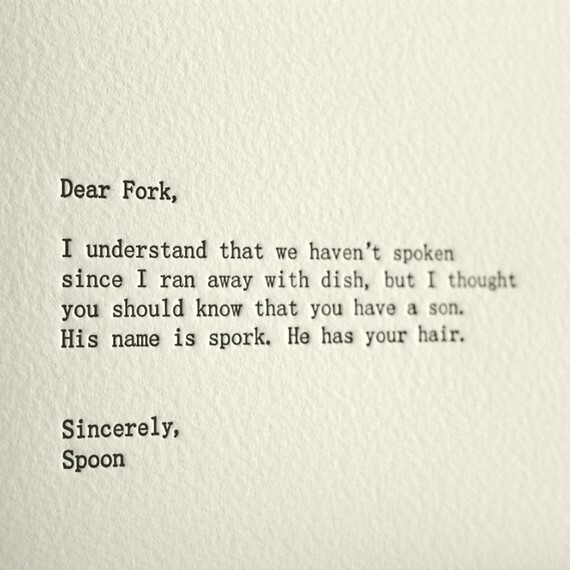 This Dear Fork card is another one of those prints I would like to frame and put up on the wall. Right along with this one, and this one, and this one, oh and definitely this one just because I think it's funny. I have a serious paper addiction folks. I collect cards. I collect stationary. I have stationary from when I was 3 years old and my grandma used to write me lovely letters on lovely stationary. Good thing I stopped collecting stickers. Remember the scratch 'n' sniff stickers? Man those were the days. This week I went through all of my paper; scrap booking stuff (so glad that era is over), cards I've made, letters I've received, stationary from Japan, oh and old pictures too. The whole ordeal took me about 7 hours I-kid-you-not! I kept some stuff and threw out a bunch and also gave Enzo's friend, little Juniper, a bag full of paper stuffs for her to enjoy. I want the next generation of little girls to be paper aficionadas like I am. Now ask me if I've stopped looking at prints online. Ask me if I don't want to buy that print up top. I really need to buy that print! HomeFries, a new podcast site that hosts podcasts from 2 of my favorite bloggers, Joy from Joy the Baker and Tsh from Simple Mom. I can't wait for next week when new podcasts come out. This blog post, what I learned from almost 2 months almost unplugged is a must read for anyone who takes blogging seriously. I want to spend hours on this site reading about food design. I also want to make a pie graph cake that indicates the ingredients of the cake in percentages. If I were to garden I would buy these just because of the way it's packaged. I loved reading all the tweets from BlogHer Food. I wasn't able to go but I felt like I was there with all the tweets that were pouring into my stream. I'm excited for the long weekend. If I have some extra time I will certainly read over the transcripts from the BlogHer Food sessions. And because our sugar free month is almost up I'm letting myself think about desserts a little tiny bit. Mostly I've just been looking at What Katie Ate to get inspired. She really does have the most beautiful food photography doesn't she? Seriously Katie, feed me! 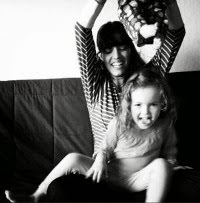 Last but not least I wanted to share a guest post about wooden spoons and homeschooling I wrote for Live and Enliven. Go check it out and leave a comment. I'd love to hear your thoughts. What about you? Anything great you've read lately or written perhaps. I'd love to read what you've been up to. Feel free to share links in the comments. Have a wonderful [3 day] weekend.